Our offers are only available if you BOOK DIRECT through this website. See below for all the details of our current offers. You can keep up-to-date with our special offers, late availability announcements & news by signing up to our mailing list. No spam, we promise! Abbey Guest House will use the information you provide on this form to be in touch with you to provide updates and special offers. You can change your mind at any time by clicking the unsubscribe link in the footer of any email you receive from us, or by contacting us at info@abbeyghyork.co.uk. We will treat your information with respect. For more information about our privacy practices please visit our website. By clicking below, you agree that we may process your information in accordance with these terms. 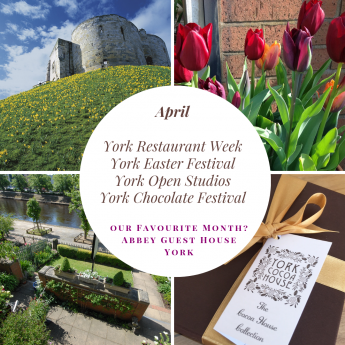 We Love April in York! Save up to £20 per night on our bed and breakfast rates for week-day stays of 2-4 nights and long weekend breaks of 3-4 nights. Just put your dates into our booking calendar to check availability & rates. Offer runs from now until 30 April 2019, subject to availability. 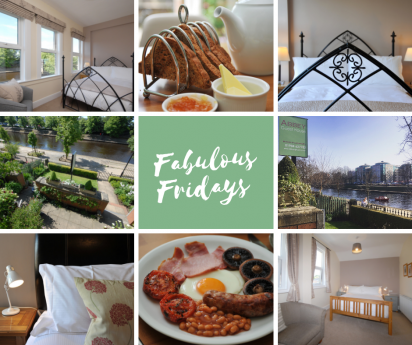 Single Night Stays - Fabulous Fridays throughout March & April! We usually require a minimum of two nights to stay on Fridays or Saturdays, but occasionally existing bookings create single night availability. Available to book online, or contact us directly for more details. We have an exclusive offer especially for our guests from the fantastic team at Ambiente Tapas! 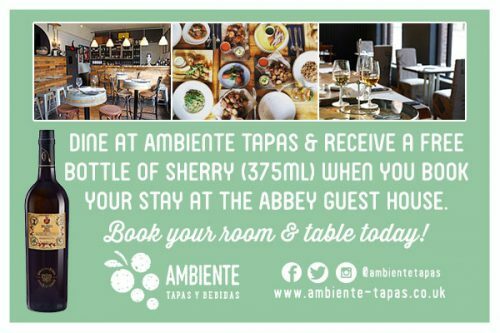 Just select ‘Ambiente Tapas Offer’ in the booking extras when you book your stay with us. We’ll then send you a link so that you can book your table or if you prefer, we can make the reservation for you. If you ‘Like’ our FaceBook page or ‘Follow’ us on Instagram you’ll be one of the first to hear about any changes to availability including cancelled reservations. To check ALL our availability & for our BEST rates please book direct using this website.